David: "I have recently unearthed this Norton 16H. It has been in a shed for the last 30 years and I think it is quite interesting as it has a separate oil tank and a mousetrap carburettor. 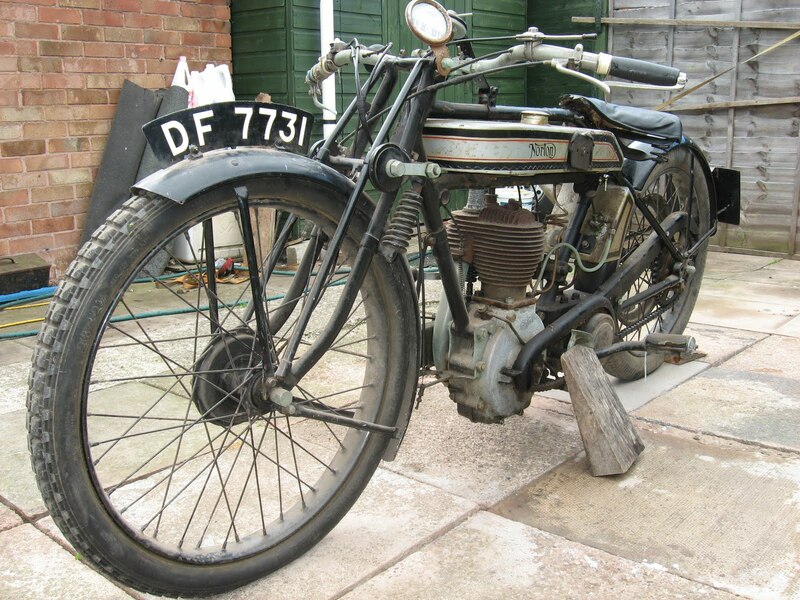 I have been told it was raced by a Mr Jack Underwood. 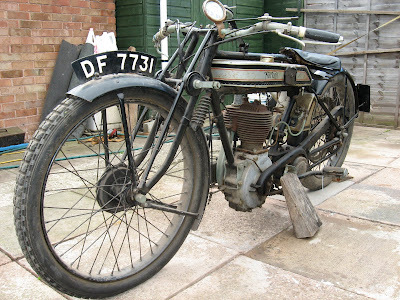 The bike will be kept in this condition and not restored." Simon: "The numbers (frame number 65XX and engine number 42XX) match up - albeit the frame number is shown in the Works records as 65XXs. However the info in the records is disappointingly sparse. 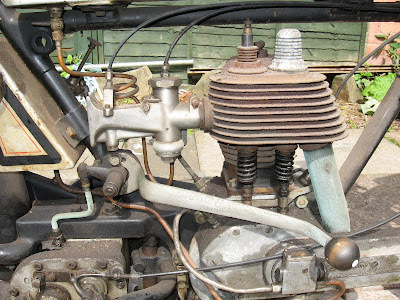 The model is shown as 16H and the magneto number as 122914, with Brown and Barlow carburetter and 26 x 2 1/2 tyres. No gearbox number given. On the despatch details page, all that is entered is the 'card number' (I guess this is the works job card or build card for the bike) 3743. At this stage, this situation seems to have been commonplace - on this particular page (the first that exists incidentally) of 19 entries only 10 show the dealers to whom the bikes were sent and no end user details are shown atall. Despatch dates shown for the ten are all in the range November '22 to January '23. All were 16Hs. Regarding the 16H, it does look 'later'. I guess yes a 1923 model originally. 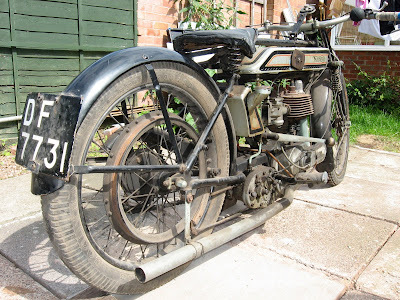 I think the separate oil tank was fitted to the '23 works bikes and doubtless could be ordered if wanted but perhaps was a later fitment. The tank looks wide for this date. Also note the forks are the posh variety of Druids with the dampers - not fitted as standard. Fitting a mousetrap Binks was the twenties equivalent of the 'go faster' stick-on stripes for cars in the fifties/sixties. But bear in mind that the early twenties 16H could be made to go. Driscoll reckoned his ex works 16H was better by far than the first OHV bike he got! The oil pump is a later fitment too - furthermore it is a Pilgrim and not a Best and Lloyd. I don't know of any Jack Underwood though there are a couple of J. Underwoods who were VMCC members in the 1988 VMCC members list - one living in Blandford and the other in Crawley. One of them (the Blandford one) was a member in 1973 but neither in 1960....Judging by the Blandford Underwood's membership number he must have joined the club in the late sixties. None of this is really much help!" 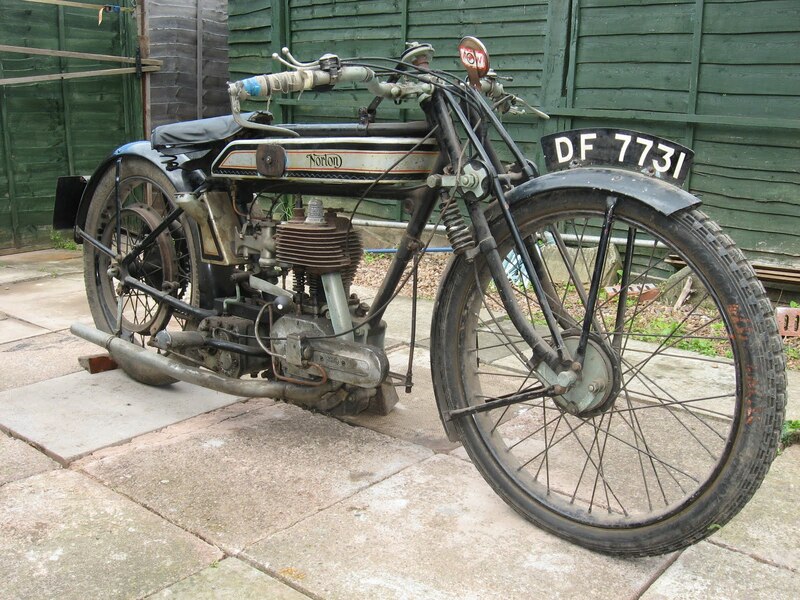 Martin:"The registration is a Gloucester County Council one issued in 1929, so whatever it did between 1923 and 1929, it did so with another identity. By 1929, a 16H would have been passe, but as I know from running a 1920 16H, they have a lot more spirit than many early OHVs, and it would still have been a capable performer in 1929."